i think i may have just found a new holiday staple for the engstrom household. christmas in my family is typically marked by a few staple things - glögg, my mom's secret toffee, my grandmother's caramel. whenever i get to enjoy these things, it feels like christmas. i can't imagine a holiday without having these treats. i think this is one of my favorite things about the holidays - being able to spend time with family and making amazing memories. i've been so incredibly blessed to grow up in a close tight-knit family, immediate and extended. life continues but no matter what, those memories always stay with me. last time i was at my good friend angie's house, she pulled a few things out of her pocket. this was the last treat that she gave me and holy flipping shiznit. as you already know, i am 100% addicted to coffee. chocolate isn't half-bad itself. but when you throw the two together, especially as fudge, i am not sure there is anything better! making candy is not necessarily the easiest. more than anything, it is time-consuming. if you do not have patience, i can promise you that you will have a difficult time with this recipe. it is not difficult, or complex, but standing at the stove, waiting for the mixture to heat to 234°F does take a good amount of time. my suggestion would be to grab a big glass of wine, or a holiday beer, put on your favorite christmas music, and enjoy the process. this is easily one of the best fudges that i have ever come across. i have eaten about 5 pieces in the last 2 minutes. in all honesty, i think it rivals some of the best fudges that i have purchased from stores. it is that good. so give it a try! line 8-inch square glass baking dish with aluminum foil, overlapping sides. combine bittersweet chocolate, marshmallow creme, unsweetened chocolate and vanilla extract in medium bowl. mix water and espresso powder in heavy large saucepan until espresso powder dissolves. add sugar, sweetened condensed milk, whipping cream and unsalted butter and stir over medium heat until sugar dissolves, brushing down sides of pan occasionally with wet pastry brush. attach clip-on candy thermometer to side of pan. increase heat to high and bring mixture to boil. reduce heat to medium-heat and stir constantly but slowly with wooden spoon until candy thermometer registers 234°F, about 12 minutes (this is a lie, it takes much longer). immediately pour mixture over ingredients in bowl (do not scrape pan). stir mixture vigorously with wooden spoon until all chocolate melts and fudge thickens slightly, about 3 minutes. transfer the fudge mixture to prepared baking dish. smooth top of fudge in pan with rubber spatula. refrigerate fudge uncovered until firm enough to cut, about 2 hours. using aluminum foil as aid, lift fudge from pan. trim edges of fudge. cut into 30 pieces. note: fudge can be prepared week ahead. store in airtight container in refrigerator. 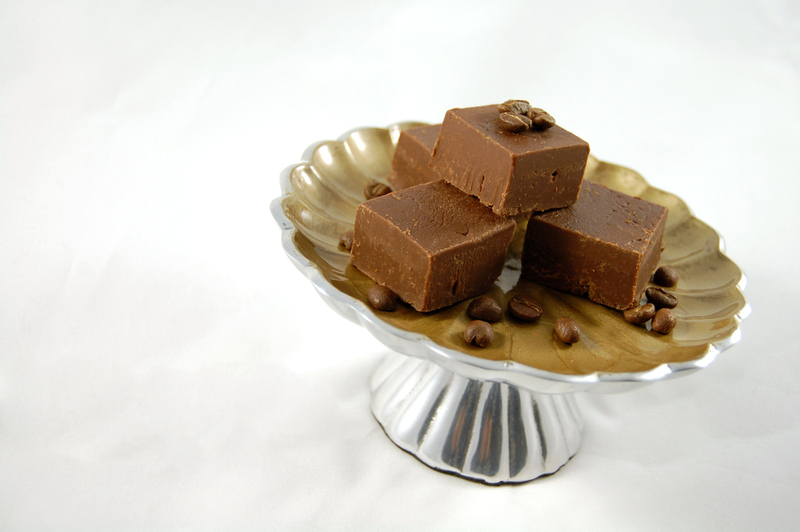 bring fudge to room temperature before serving.